THEY improv provides Chicago scavenger hunts for a variety of groups looking for new approaches to bringing employees together and fostering a sense of teamwork. Working as teams, the employees problem solve, assess priorities and assign tasks. We also have advanced versions that convert the game into more of an Amazing Race. This adds team building elements along the way and increase the challenge as well as providing additional photo opportunities. Working together as a group can sometimes be a troubling proposition. Competition between internal teams is a great way to quickly lower the barriers among coworkers. Having teams compete in a Chicago corporate scavenger hunt is a perfect way to quickly generate your Illinois company team building success inside the loop and out. THEY improv works with your managers to determine your Illinois team building needs and custom builds a Chicago corporate scavenger hunt that can be used to develop skills among your staff that can help your company achieve its goals. We can provide additional team building options to add to the fun, such as adding Amazing Race styled elements to the adventure. THEY improv can place facilitators at various locations and for teams to receive new sets of instructions, team building activities must be performed. Of course the activities would be fun in nature and the participants are unlikely to know that they are team building at the time. After all, they're just having fun. This allows us to quickly multiply the value of the activity and better enable the employee bonding of the corporate team building event. These custom-built events can be performed anywhere. From Lincoln Park, inside the Loop, Grant Park or anywhere else. Often they are done in public at venues with the general public wondering what's going on. Spreading geographically across an "operations area," teams strive to achieve their goals efficiently in a festive atmosphere. Of course permission may be required to hold these on private property, such as at area shopping or clubs. And your people need to not be a nuisance to local businesses. Give us a contact person for your event in the Greater Chicagoland area and we'll help make it happen! 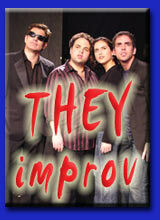 And THEY improv offers something that almost no other company can, bad-weather options. While often Chicago corporate scavenger hunts are performed outside, sometimes the weather doesn't want to cooperate. That causes many companies to simply bow to the inevitable and cancel the Illinois team building workshop event. THEY improv utilizes their improvisational actors in the Chicago corporate scavenger hunt, which means that an improv comedy show or Illinois company team building workshop can be presented at a moments' notice. This show has been specially constructed to allow for team building and bonding with one another while enjoying a comedic performance. That's right, book a public Chicago corporate scavenger hunt and get a back-up company Illinois team building workshop event at no extra cost! Now that's a great idea to be most efficient! With years of experience providing business consulting services, the staff of THEY improv bring their skills to solve your needs. Whether you are looking for help in achieving culture change, merger or acquisition assimilation, simple Illinois team building workshops, employee recognition, bonding, meetings and incentives or skills training, the professionals at THEY improv can assist you in unique ways.